In this file photo, a view of signage can be seen at the MoviePass House Park City during Sundance 2018 on January 21, 2018 in Park City, Utah. 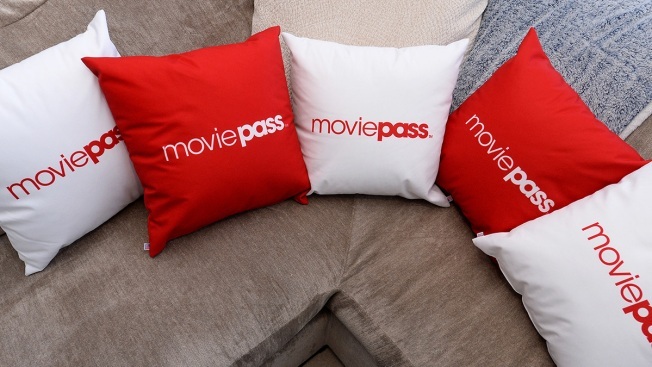 $5 million of the loan will be used to help MoviePass make payments to its "merchant and fulfillment processors"
The parent company of movie subscription service MoviePass received a loan worth more than $6 million after a “service interruption” Thursday prevented it from making required payments, according to a Securities and Exchange Commission filing. If it fails to do so, the processors would stop processing payments. That appears to have been what happened on Thursday for the company's more than three million subscribers. The filing notes: "Such a service interruption occurred on July 26, 2018." Moviegoers at the time complained on social media that they were unable to check-in. MoviePass had said Thursday on Twitter it was "experiencing technical issues with our card-based check-in process" and "diligently working to resolve the issue." A spokesperson for MoviePass gave NBC the following statement: "We apologize for the inconvenience caused by a temporary outage in our app over the past day. We have handled the issues on the back-end, and our app is now up-and-running with stability at 100%. We thank our members and our community for their patience and ongoing support, and we appreciate their commitment to our vision as we revolutionize the movie industry. We’ve also posted a letter to subscribers on our social media channels and in our app communicating adjustments to the service and our plans for the future." To our subscribers - we are aware an investigating an issue that is preventing users from checking-in to movies this evening. We ask for your patience as we look into this and recommend waiting for further updates before heading to the theater. We are still experiencing technical issues with our card-based check-in process and we are diligently working to resolve the issue. In the interim e-ticketing is working. We apologize for the inconvenience and appreciate your patience while we resolve this issue. We've determined this issue is not with our card processor partners and will be continuing to work on a fix throughout this evening and night. If you have not headed to the theater yet, we recommend waiting for a resolution or utilizing e-ticketing which is not impacted. The loan comes after Helios said in a July 10 SEC filing that it could lose at least $45 million this month, NBC News reported. The company said then it had more than $13 million available in cash. MoviePass CEO Mitch Lowe told NBC News earlier this month that customers shouldn’t be concerned about the company’s future. MoviePass allows users to see one movie per day for a $9.95 monthly fee. In a statement last summer, AMC called the MoviePass business model “shaky and unsustainable.” In June AMC unveiled a rival subscription program.